Combining Drapery Valances with Hunter Douglas Silhouettes. 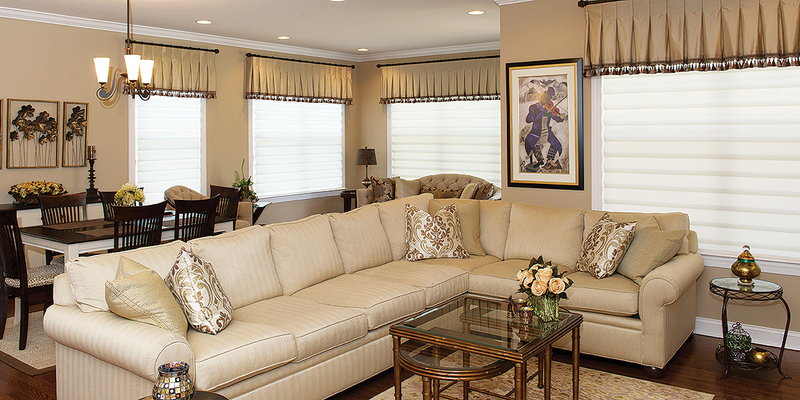 So, we don’t really promote our Valances very often but we really love these that we did for a Client in New Jersey. Valances can be such a great way to add a decorative detail without adding “too much” heavy fabric or drapery. The Designer and Our Client decided to go with Hunter Douglas Silhouettes Soft Roller Shades on all of the Windows. The Silhouettes are fine but can be very, very, shall we say “bland” when they are by themselves. So, the Designer specified a Custom Window Valance Treatment to go over the top of the Silhouettes. This gave the Client the best of both worlds, they wanted the privacy and simplicity of the Silhouettes with a little more customization and detail that we were able to provide with the Valances. 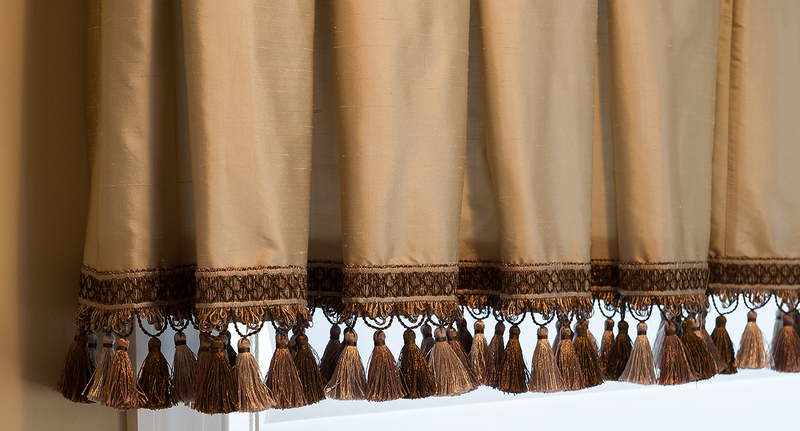 We made the Valances in Pebble Dupioni Silk, Lined and Interlined with an Inverted Pleat. We added our Windsor Braid as the decorative element to the edge. We love to make custom window valances at DrapeStyle. There is so much variety of what we can do in terms of adding trims and fringes you are really only limited by your imagination. 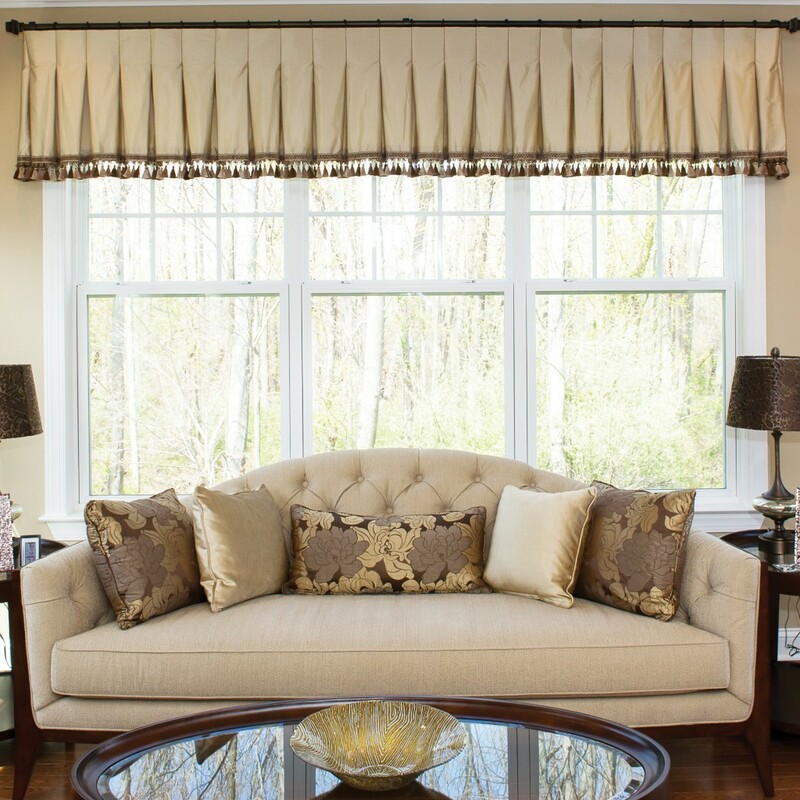 Our Seamstresses have been making valances for decades and they make a great compliment to your window treatments. We will often make valances to compliment your drapery and add a little extra detail to completing your room. Valances are also a good option when combined with custom made Roman Shades which can be layered under the valance to add privacy. At DrapeStyle, our custom made valances and window treatments are available in any length, width or fabric that we offer. Please call one of our Designers who can help you design your next set of window treatments and provide some great professional design advice.